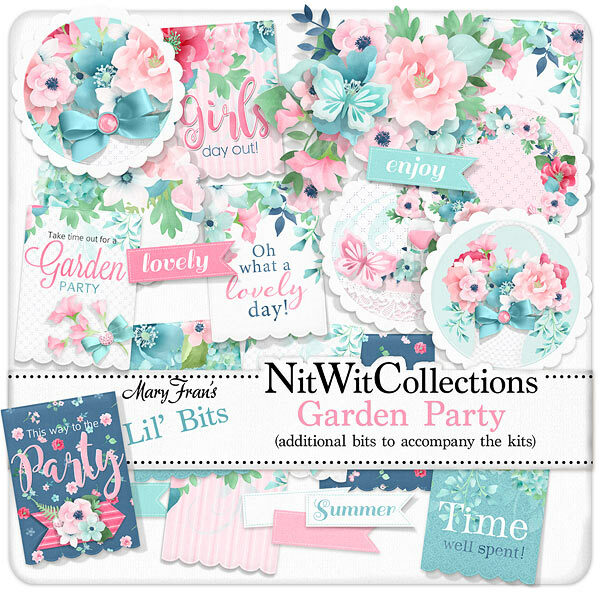 Lil' Bits "Garden Party" is a DO NOT MISS additional digital elements pack that has so many finished elements that you will have a hard time choosing what to use first!! Ease and beauty for creating your cards, scrapbook layouts and mini albums. Don't miss out on these digital elements as they are not included in the FQB "Garden Party" Collection so please don't miss out on owning and creating with these elements! 1 Tag element - "Oh what a Lovely Day"
1 Tag element - "Time well spent"
1 Tag element - "Girl's Day Out"
1 Tag element - "This way to the Party"
1 Tag element - "Take time out for a Garden Party"
5 Blank tag elements that are well embellished in several different designs and colours to be sure that one of these will suit your creative vision! Write on them, add photos, or use as stand alone elements to be sure that your results will be stunning! 1 Word strip - "Lovely"
1 Word strip - "Enjoy"
1 Word strip - "Summer"